With the weather having dominated and decimated racing at the Aon Maadi Cup during the week, there was some relief when the A finals got underway on Saturday morning on calm waters - though under a very ominous sky. Highlighting finals days were the Aon Maadi and the Levin Jubilee cups for the best Junior eights and the two big races both delivered something special for the 6,000 or so spectators on the banks of Lake Ruataniwha – but the pundits who thought there might be a change ‘on the throne’ of both events were wrong. 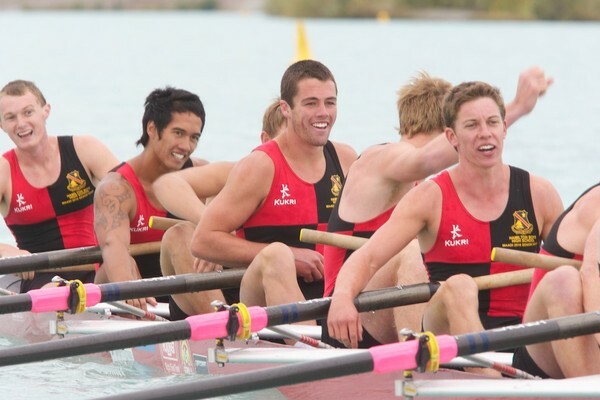 Rangi Ruru dominated the Levin Jubilee eights and Hamilton Boys took yet another Aon Maadi Cup. Much of the season has been spent discussing who might beat the Big Two at this regatta, but on the day it all came right for the two title holders. In the women’s race, Rangi took an early lead and spent the majority of the race extending it. A smooth Westlake gave chase, but could do nothing about Rangi’s superior base speed. Marlborough Girls, one of the pre event favourites, took third. Hamilton Boys had spent much of the week sitting around with the rest of the athletes as the wind gusted – and stayed as fresh as they possibly could for the eights race, having scratched from a certain medal placing in the Under 18 pair. That freshness showed as they bolted out of the blocks, taking Westlake Boys and Auckland Grammar with them. At 500 metres they kicked again and opened a gap and that was pretty much the state of play until the last 250 metres when Westlake, arguably with a smoother technique, whipped up their rate for a final attack and re-gained a healthy overlap. Time was running out though, and Hamilton certainly had the edge in the power stakes as they surged across the line to a three quarter length verdict. A packed morning of close racing was highlighted by two high quality Under 18 coxed fours races, with incumbents Hamilton Boys winning the Springbok Shield and Rangi Ruru winning the Dawn Cup, but both had much closer races than of late. Westlake Boys late charge into second place in the Springbok got them to within three quarters of a length of the Hamilton Boys crew, but Macky, Ross, Stroud, Kirkham and Shepherd maintained their strong pace to win. Rangi Ruru led all the way in the Dawn Cup to finish ahead of Marlborough Girls and Sacred Heart. Marlborough had a great opening to the day with their boys kicking off by winning the re-row of the Boys Under 16 double scull, a turnover of the result on Friday when the race was run with St Bede’s Christchurch winning and Nelson protesting unfair conditions. The appeal was upheld and second time around Marlborough edged out immediately to take control of the race. St Bede’s sculled through to second with Nelson's second chance yielding a third place. Marlborough did it again a few moments later too, with Harvey and Meaclem dominating the Under 18 pair. Rangi Ruru won the women's pair, St Andrews the Under 15 boys quad and Craighead were popular winners of the girls Under 17 coxed fours, just a hair's whisker ahead of Rangi - a great result for them after targeting a dais spot. Hamilton Boys looked comfortable in the Under 17 Coxed Fours, finishing clear water ahead of Westlake College. The result would have been particularly pleasing for national squad coach Dave Thompson, with his son Samuel in the winning crew. Another good race unfolded in the Boys Under 18 quad - with St Thomas's of Canterbury putting in a determined performance in a fierce final to win and mark themselves out as one of the class boats of the regatta.